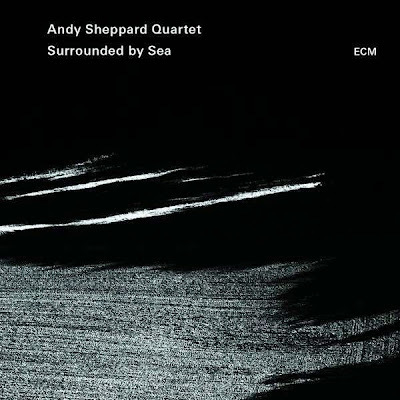 Surrounded by Sea, saxophonist Andy Sheppard’s third release for ECM, sees his Trio Libero with Michel Benita on bass and Seb Rochford on drums expanded to a quartet with the addition of guitar and electronics magician Eivind Aarset. The result is a quiet masterpiece. There is an extraordinary stillness about much of this album that holds the listener as Sheppard's unmistakable voice on saxophone gently exhales perfectly shaped melodic fragments, kept floating and moving by a magical combination of rustles and slaps from drums, eerie electronics and perfectly placed resonant bass notes. Some of the melodies are familiar with an exquisite rendering of Elvis Costello's I Want to Vanish and the traditional Aoidh Na Dean Cadal Idir makes several appearances, seasoning the collection. The rapport and interaction between the core trio is electric and each piece evolves and gathers in intensity as a result, Aarset expanding the palette sometimes with mysterious washes at others with complementary melodies. There are plenty of flurries and more energetic moments to offset the contemplative mood. Tipping Point opens the set with a throbbing pulse on bass, Seb Rochford's They aren't perfect and neither am I is all asymmetric skittering fragments from the drums breaking up the flow, The Letter’s glowing melody is gradually jumbled up and the ironed out again. The set closes with Looking for Ornette that develops a steady groove as the leader's soprano sax lines spiral off in exploratory gestures. The singing melodic lines of Andy Sheppard's saxophone, pared back to essentials, may be the golden thread running through this album but the rest of ensemble turn in perfectly judged performances. Benita's is a no less melodic resonant voice, and Rochford is by turns an impossibly restrained colourist and then an urgent muted percussionist. Aarset is an inspired addition to what was already a very special collaboration. This album is a very big treat best consumed whole. Sit back and and immerse yourself in a distinctive and beautiful sound world.